1-855-F'IN-JUNK does more than just junk removal. Our crew removed the graffiti from this commercial property. Junk piling up around the building? Tenants moved out and left a mess? If you're a property manager or building owner, there are a lot of ways for unforeseen messes to pop up, and cleanup can be a real nightmare. At 1-855-F'IN-JUNK, we provide the one-call solution. We get the junk hauled away fast, and we can take care of various additional cleanup tasks - whatever it takes to get your property back in order. Just give us a call or contact 1-855-F'IN-JUNK online to let us know what your needs are. 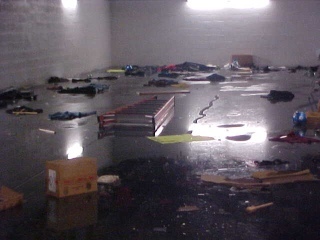 A flooded building prior to clean-up. Disaster can strike at any time, but 1-855-F'IN-JUNK can get you back to business. Whether it's damage from flooding or large amounts of debris after a major renovation, 1-855-F'IN-JUNK got you covered. We'll clear out the junk, water, or whatever the issue may be to get the place operational and help prevent further damage. Removal of old carpets, drywall, etc.